Week #3, Friday, June 12 from noon-1:00 pm in LSC 3. Dr. Soumya De a Postdoctoral Fellow with Prof. Lawrence McIntosh. He is in Vancouver from August 2011. Soumya earned his Bachelor and Master of Science degrees from IIT Kharagpur. He joined the doctoral program at Cornell University in Ithaca, USA and received his PhD in 2011. His research interests include structural and dynamic basis of protein function, interaction of biological macromolecules and design of thermostable enzymes. ETV6 (or TEL) is an essential ETS family transcriptional repressor and a putative tumor suppressor with key roles in blood cell formation. Genetic defects in the ETV6 gene are linked to various forms of leukemia. ETV6 binds to specific promoter sites in our genome that contain a core 5’GGAA3’ motif. Using a combination of solution-state NMR spectroscopic and X-ray crystallographic methods, we have elucidated the molecular basis of DNA recognition by the winged helix-turn-helix ETS domain of ETV6. Importantly, an autoinhibitory module appended to the C-terminus of the ETS domain weakens DNA binding by ~ 50-fold. The autoinhibitory module consists of a helix H5 that sterically blocks the DNA-binding interface. Using NMR relaxation and amide hydrogen exchange measurements, we have found that this helix is only marginally stable and completely unfolds when ETV6 binds to DNA. This leads to our hypothesis that ETV6 can be regulated in vivo by protein partnerships or post-translational modifications that alter the stability of its autoinhibitory module. 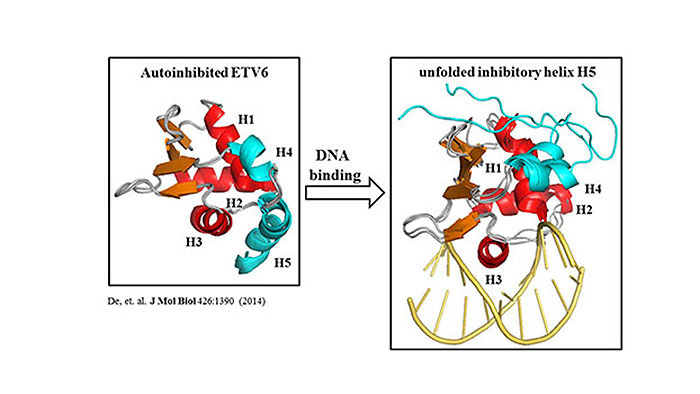 To systemically investigate the coupling between protein (un)folding and DNA-binding autoinhibition, we designed several ETV6 mutants that have altered helix H5 stability. Furthermore, a completely autoinhibited mutant was designed by introducing a disulfide bond that locks the inhibitory helix onto the DNA-binding interface. The local stabilities of these mutants were measured by NMR-based hydrogen exchange experiments, and their DNA-binding affinities were measured by an electrophoretic mobility assay (EMSA). Consistent with our hypothesis, the binding affinities of the mutants progressively weakened with increasing stability of the inhibitory helix. Collectively, this study defines the energetic linkage between the stability of the autoinhibitory module and the resulting autoinhibition of ETV6 function at the level of DNA binding.